Earn 10 Stamps. GET 1 Free Edit. Earn 1 stamp for every $10 spent. 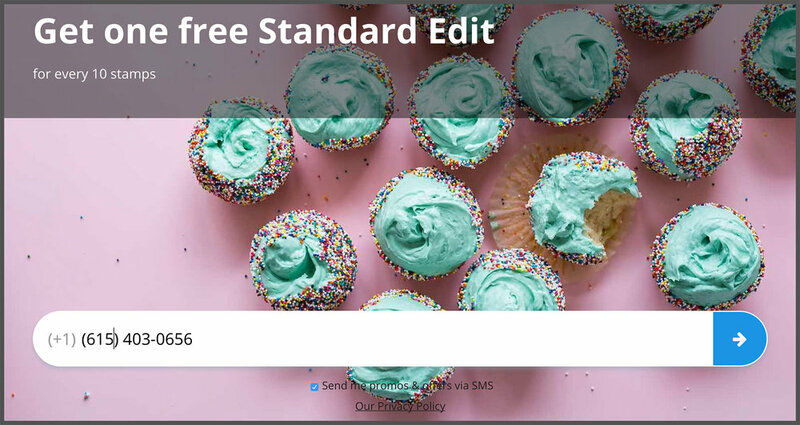 Get 1 free standard edit ($15 value) for every 10 stamps collected. 7) 1 Loyalty Rewards coupon can be exchanged for 1 Standard Edit (not an Advanced Edit, not a Lollipop Photos edit), 2 Loyalty Rewards coupons can be exchanged for 1 Lollipop Photos edit, and 3 Loyalty Rewards coupons can be exchanged for 1 Advanced Edit. OUR Loyalty REWARDS PLATFORM IS VERY INTUITIVE. 4) Click on the red "Loyalty Rewards - Signup/Manage" link in the footer of our website. 2) Click the blue "Arrow" button. 2) We will add the appropriate number of Loyalty Rewards stamps based on how much you spent. 1) You will receive a text message letting you know that your Loyalty Rewards account has been set up and that your Loyalty Reward stamp/s have been credited to your account. 2) Click on the blue link to access your account. 1) Your Loyalty Rewards card will appear. If you have any Loyalty Rewards stamps a blue "Check" will appear in one of the nine "White Circles." 2) To earn a free Loyalty Rewards stamp, click on the grey "Person Icon" in the upper right hand corner. 3) Fill out "Name" and "Email." 4) Click the blue "Get A Free Stamp" button. 5) A blue "Check" will appear in one of the nine "White Circles," confirming that you received your Loyalty Rewards stamp. 1) Whenever you have an appointment, whether In-Studio or On-Location, we will add Loyalty Rewards stamps based on how much you've spent. 2) Once you've earned 10 Loyalty Rewards stamps you will earn a Loyalty Rewards coupon which you will see at the bottom of your account. 3) You will also receive a text message letting you know that you received a Loyalty Rewards coupon. 4) You can build up your Loyalty Rewards coupons. If you have more than one, you can see at the bottom of your Loyalty Rewards account. 5) Just let us know when you want to cash in any or all of your Loyalty Rewards coupons. NOTE: 1 Loyalty Rewards coupon can be exchanged for 1 Standard Edit (not an Advanced Edit, not a Lollipop Photos edit), 2 Loyalty Rewards coupons can be exchanged for 1 Lollipop Photos edit, and 3 Loyalty Rewards coupons can be exchanged for 1 Advanced Edit. 3) Click on the red "Loyalty Rewards - Signup/Manage" link in the footer of our website.